Delvin Choice took the stage tonight on THE VOICE for his Top 10 video performance. Jake sang “Bright Lights” by Gary Clark, Jr. On tonight’s show the remaining artists from each coach, Blake Shelton, Adam Levine, Usher and Shakira’s team performed live for America’s vote and the chance to move on to the Top 8. Did you miss tonight’s episode? If you did miss it, we watched it and we recapped it right here for you. On tomorrow night’s episode America will vote to eliminate two artists from the competition. The three artists with the least number of votes will face elimination and sing once again in hopes to stay in the competition. One will remain by surviving the Instant Save and the other two will be eliminated. British pop/rock/r&b band Rixton will perform live on tomorrow’s show and coaches Shakira and Usher will perform a song with their respective teams on the Tuesday show. 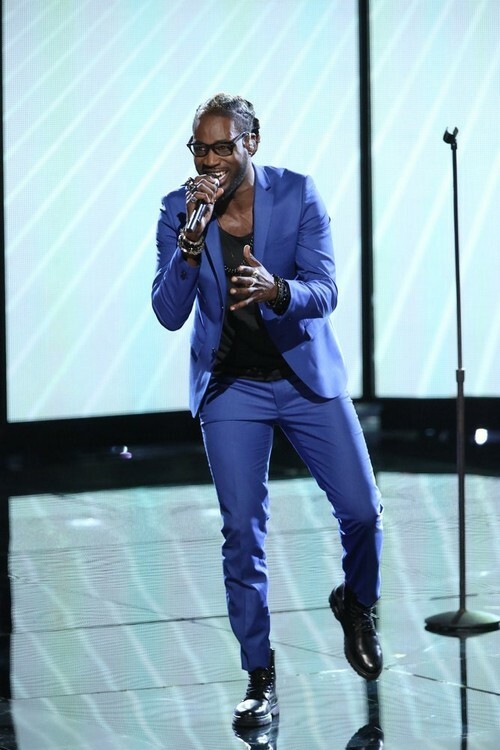 Check out the video below and let us know what you thought of Delvin Choice’s performance? Was it enough for him to move on to next week’s show? Did you miss any of the other artists performances? If you did, you can see them all HERE! Sound out in the comments below and let us know your thoughts were of tonight’s The Voice Top 10 Performances.